The Senseonics Eversense CGM recently received FDA approval and is in the process of launching in the United States (it's already up and running in Europe). It has been designed to be the first ever CGM with an implantable sensor that lasts up to 90 days. The Eversense System consists of a fluorescence-based sensor, a smart transmitter worn over the sensor to facilitate data communication, and a mobile app for displaying glucose values, trends and alerts. While being light, discreet, and comfortable to wear, the system’s smart transmitter interprets glucose data from the sensor and sends it to the system’s mobile application via Bluetooth, so patients can review their glucose data to help them make daily diabetes decisions. No weekly sensor self-insertions: With Eversense, a trained health care provider numbs the area and places the sensor in the upper arm and you’re good to go for up to 3-months. Quickly detects glucose highs and lows: In clinical studies, the Eversense system detected 95% of hypoglycemic episodes (70 mg/dL) and 99% of hyperglycemic episodes (180 mg/dL) within 15 minutes. Alerts you can see, feel, and hear: The Eversense CGM System can be configured to provide three types of alerts - visual, auditory, and on-body vibe alerts, which can provide you with an additional safety advantage, even during sleep. Discreet and flexible: The smart transmitter, with its low profile and flexibility to remove and reattach without wasting a sensor, enables a greater level of discretion. Check out this article from Beyond Type 1 with reviews from two people with T1D who have tried out the Eversense. They both have a lot of insight about the nuances of using the Eversense. For example, I learned about the advantages of the adhesive: "The adhesive is by far the main differentiator of the Eversense from their competition – this was easily the best thing for me. Because the sensor is fully below the skin, the transmitter adhesive can be changed as often as you like. Each adhesive patch lasts a day and can be peeled off and stuck right back on multiple times per day. Because the adhesive only has to last a day, it is completely hypoallergenic. Technically, you can stick the transmitter on however you like – while at work once, I ruined my Eversense patch and just stuck the transmitter back using materials from an office first aid kit!" Definitely check out the article for more practical knowledge about using the Eversense. Researching your pump options? 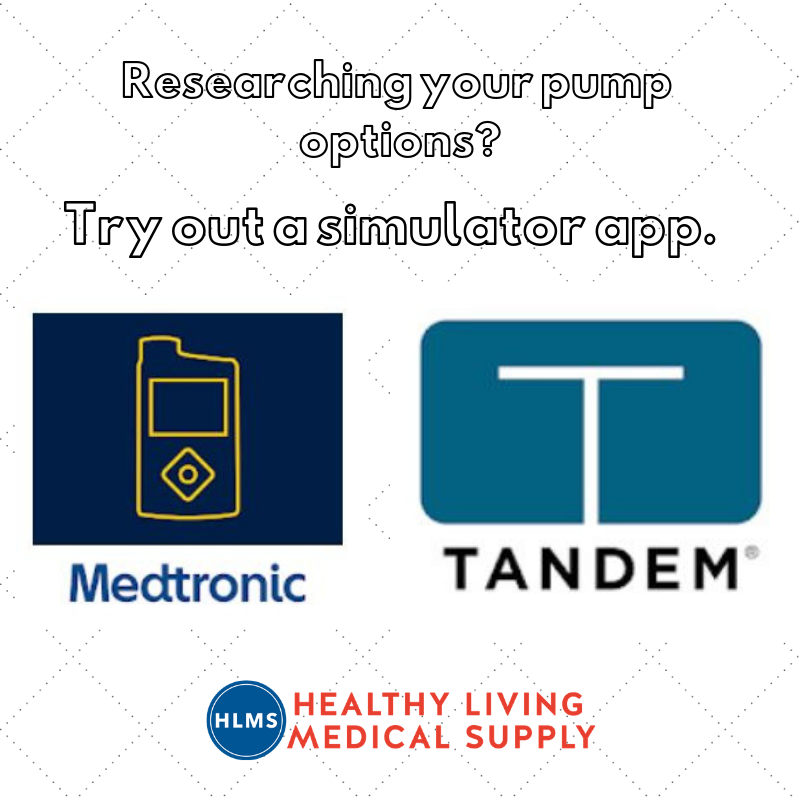 Here are some helpful tools from Tandem and Medtronic to help you understand the benefits of different insulin pumps on the market. With the App, you can experience the touchscreen interface of the Tandem t:slim X2 Insulin Pump with Basal-IQ Technology using a smartphone or tablet. You can also enable "Tool Tips" for a tour of the pump's key features. The App provides info about the pump's technical specifications and access to a glossary of common terms for better understanding. Download the t:simulator App at the bottom of this page. This application provides step-by-step instructions on the different features of the 670G and 630G insulin pumps. There are training resources for both systems and the capability to explore the insulin pump through different functionality scenarios. You will find device feature videos that give more info about the Auto Mode and Suspend Before Low features. Download the MiniMed System Simulator through Google Play or on the Apple App Store. The Tandem t:slim X2 has been approved by the U.S. FDA as an "interoperable" insulin pump. An interoperable pump can be used with different components that make up diabetes therapy systems, allowing patients to tailor their diabetes management to their individual device preferences, which opens up huge future possibilities for closed-loop systems and other management technologies. In 2018, the Dexcom G6 was designated the first interoperable continuous glucose monitor by the FDA. Read the full press release from the FDA here. In November, Diatribe wrote a fantastic article about what's on the horizon for Tandem, including the Control-IQ hybrid closed loop, the "interoperable" pump designation, the t:connect mobile app, and the t:sport patch pump with hybrid wear. We wrote about Dexcom G6 becoming available to Medicare members here on the Healthy Living Blog last fall. Over the past several months we've had many Medicare members reaching out to us, asking about availability of the G6 system. This is a quick update that Healthy Living Medical Supply expects to start shipping Dexcom G6 systems to Medicare members on or around on April 1st of 2019. 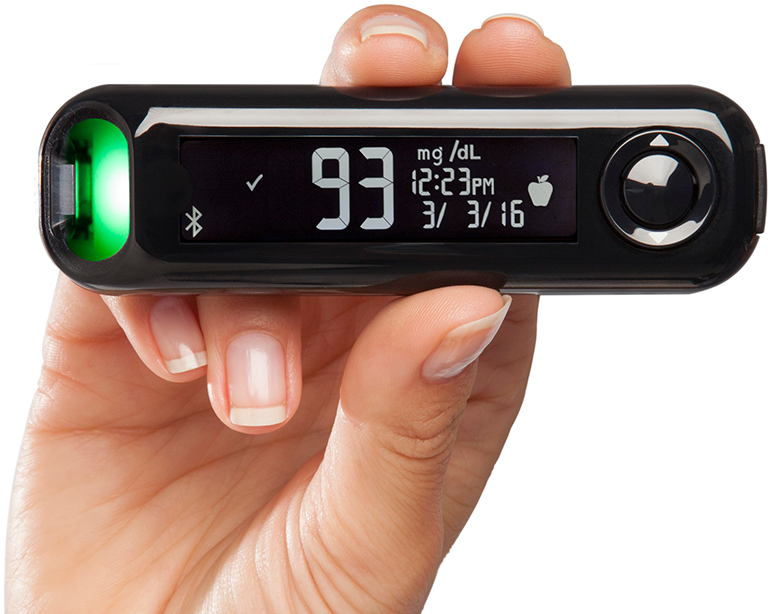 This is an exciting development because it brings an advanced CGM system that is fingerstick-free to Medicare members. The Dexcom G6 system automatically takes a glucose reading every five minutes and sends the reading to a receiver or smartphone device such as an iPhone or Android (click here for a complete listing of compatible Apple and android devices). The system also has predictive alarms to let patients know if and when they are trending toward a low blood sugar state. The Dexcom G6 system will be available to qualifying Medicare members who are on an insulin pump or taking insulin three times or more per day via injection AND who are testing four times or more per day. Interested in being updated when Healthy Living begins shipping the Dexcom G6 system to Medicare members? Fill out the brief form below and we'll be in touch! February 18, 2019 -- Today, Healthy Living Medical Supply, a mail-order diabetes supply company headquartered in Detroit, Michigan, announced that they now provide the Abbott Freestyle Libre continuous glucose monitoring (CGM) system to eligible Medicare members across the United States. This fingerstick-free CGM has a small glucose sensor worn under the skin, connected to a circular patch that is slightly larger than a quarter. With a 14-day wear time, it is worn on the upper arm and allows people with diabetes to view their blood glucose levels with the swipe of a hand-held reader for more effective disease management and better treatment decisions. To receive coverage for therapeutic CGM, with options including the Abbott Freestyle Libre or the Dexcom G5, a Medicare beneficiary must have type 1 diabetes or be receiving intensive insulin therapy for type 2 diabetes, and those eligible must document that their condition requires frequent insulin dosing adjustments, based on checking blood glucose levels at least four times a day. To learn more about eligibility requirements, visit myhlms.com/medicarecgm. Healthy Living has been providing diabetes supplies to Medicare, Medicaid, and commercial insurance members for over a decade with a focus on world-class customer care and a working model of continuous improvement and innovation. The company is the only locally owned diabetes supplier in Michigan. This month is a great time to zero in on some of the ways we can keep our hearts healthy. This month, the National Heart, Lung, and Blood Institute has launched #OurHearts, an initiative to encourage everyone to adopt heart healthy behaviors, together. Studies show that if you join forces at home, at work, in your community, or online, you have a better chance of staying motivated. Remember - Some physical activity is better than none. Aim for a healthy weight. Choose - Heart healthy foods and regular exercise help you achieve and maintain a healthy weight. Try - Find an eating plan that is successful for you and supports your diabetes management. Ask - Your family and friends can support you in your efforts to become a non-smoker. Check out the new Beyond Type 2 website , the sister site to Beyond Type 1 , a well-established favorite of ours. It is a beautiful site with excellent resources on a disease that will benefit from a fresh voice for information and support. I love the Recently Diagnosed? Learn the Lingo page to get started. "Launched in 2019, Beyond Type 2 is a program of the nonprofit organization Beyond Type 1. Beyond Type 2 is a place for everyone impacted by Type 2 diabetes to share their stories, get connected to the community, and find resources on topics from daily management to mental health...Beyond Type 2 hopes to radically change what it means to live with Type 2 diabetes. We aim to unite the global community and empower everyone living with Type 2 to live beyond it. With the right resources, programs, and power of our combined voices, we can redefine what it means to be a person living with diabetes – of any type." You won't regret taking some time with this website. Explore Beyond Type 2 at beyondtype2.org. *From Dexcom - If your glucose alerts and readings from the G6 do not match symptoms or expectations, use a blood glucose meter to make diabetes treatment decisions. We have also learned from our customer community and partners that many people no longer perform fingersticks at all due to the accuracy of the Dexcom G6 system. Most commercial insurances and Medicare cover CGM. Ask Healthy Living to help you get started! Diabetes management is very challenging, and it's completely normal for people to feel exhausted or stressed in the process. If you find that you are feeling worn out, frustrated, or anxious over an extended period of time, there are health care professionals who are trained and experienced to help people with diabetes distress. The American Diabetes Association (ADA) has partnered with the American Psychological Association (APA) to make it simpler for people with diabetes to get high-quality, relevant, mental health care by creating a Mental Health Provider Referral Directory. The providers listed in the directory must have either completed the ADA-APA's continuing ed program in diabetes mental health or have two or more years of experience working with people who have diabetes. Many of the doctors also offer telemedicine services - a method of receiving care from remote locations using technology. Access the provider list here. Thinking about a new pump? These websites have discussion forums where people share their experience using different insulin pumps, CGM systems, and other diabetes supplies. They are excellent independent resources to use when making a decision on what products to use, and they are also a great way to connect with other parents and people with diabetes to share experiences, resources, and support. How Will You Approach Our Favorite Food-Focused Holiday? My action plan involves being physically active ("The best way to compensate for eating a little more than usual is to be active. Start a new tradition that involves moving around away from the food. "*) and nibbling ("Have foods to nibble on while you are cooking or waiting to eat. Make sure the foods you choose won't sabotage blood glucose levels before the meal. "*) Be thoughtful and prepared so you can enjoy a special day with as little stress as possible. 1 in 11 people live with diabetes. World Diabetes Day takes place this week on Wednesday, November 14. But there’s plenty to talk about, so we’re starting early. This is a globally celebrated event and official United Nations awareness day. This year’s theme is “the family and diabetes,” with the tagline “diabetes concerns every family.” The goal is to raise awareness of the impact that diabetes has on the family and promote the role of the family in the management, care, prevention, and education of the condition. The logo for World Diabetes Day is a blue circle, the global symbol for diabetes. Find out more about the happenings of World Diabetes Day at www.worlddiabetesday.org. Healthy Living accepts Blue Cross Blue Shield of Michigan insurance (as well as many others) for insulin pumps, CGM, and diabetes testing supplies. We’re here to help when you need us at 866.779.8512 (phone), 248.577.9903 (text), and via chat at myhlms.com. More great news has been announced about CGM! The Dexcom G6 continuous glucose monitor (CGM) will be covered for Medicare beneficiaries, starting in early 2019. CGMs are DME items that provide critical information on blood glucose levels to help patients with diabetes better manage their disease. Coverage for therapeutic CGM includes certain beneficiaries who have either Type 1 or Type 2 diabetes and intensively manage their insulin. Healthy Living will be able to provide the G6 to Medicare members – stay tuned for updates on this exciting news! Read the press release directly from Dexcom. Our hearts, thoughts, and prayers go out to the individuals and families in North Carolina and South Carolina whom have been touched by Hurricane Florence and the flooding that has followed. Although Michigan is not affected by natural disasters like hurricanes, we have plenty of other reasons to take pause and invest some time in emergency planning. Probably our greatest weather threats in this area are snowstorms, thunderstorms, tornadoes, and associated power outages. For people living with different health challenges and conditions, there are unique precautions to be taken and plans to be made. For those living with diabetes, it is especially important to maintain a reasonable stock of supplies to last through an emergency. Additional supplies can be purchased through our retail online supply store or by calling us at 866.779.8512 (you can always discuss this with an agent when calling for an order or refill through Healthy Living). Secure insulin – If you can get to a pharmacy, it’s the best way to access your medicines or get emergency supplies. Hopefully the winter weather ahead treats us kindly, but it’s worthwhile to be prepared for whatever might come! Despite the weather (pouring rain all day! ), the Grunberger Diabetes Institute’s Patient Appreciation Day on Saturday, August 25 had an awesome turnout! Over 100 patients attended the event outside Dr. Grunberger’s office -- a fun, educational opportunity to understand what resources are available for diabetes care. Jennifer from Healthy Living Medical Supply attended the event, along with many of our manufacturer partners representing CGM and insulin pump solutions. The Grunberger Diabetes Institute also served food and sponsored a raffle for patients and guests. Dr. George Grunberger is internationally renowned for his work with people with diabetes. His office is located in Bloomfield Hills, Michigan, and offers cutting-edge diabetes and endocrine problems management, one-stop service for comprehensive care, a multidisciplinary team, and participation in research studies. Learn more about the Grunberger Diabetes Institute and check out their blog. The American Association of Diabetes Educators (AADE) annual conference just passed in Baltimore, Maryland. Healthy Living was there to meet diabetes educators and product manufacturers and to simply learn. Educators are in the trenches with patients and their families, teaching them the skills to be successful and guiding them in the various technologies and tools used to manage the disease. We support the work of diabetes educators on a daily basis by providing them with meter kits to use for new Healthy Living patients in the clinic during training. Healthy Living also reinforces the teaching of diabetes educators by making sure our patients receive refills for continuous glucose monitoring (CGM) supplies, insulin pump supplies, and testing supplies on time, every 30 or 90 days (depending on the patient’s insurance plan). What it comes down to is that patients can have the best technology in the world, but if they don’t have education, they won’t be able to take full advantage of an insulin pump or CGM system. Read the article New Diabetes Technology Options Can Ease Disease Management, but Education Key for more information about this. Diabetes educators are absolutely essential to the well-being and successful treatment plans of people with diabetes. The blood glucose meter is one of the most important technologies to help people with diabetes manage their disease. Many of the patients we serve, particularly those using a Medtronic insulin pump, use Contour Next test strips to test their blood glucose levels. To accompany this type of test strip, we now provide the Contour Next ONE smart meter for blood glucose monitoring. This meter is wireless and has an app for managing data from readings on a smart phone. Approved by the FDA in 2016, the Ascensia Contour Next ONE is the latest in the line of Contour meters from the company formerly known as Bayer. To find out more about the Contour Next ONE smart meter and other diabetes technology, contact us at 866.779.8512 (phone) or 248.577.9903 (text). 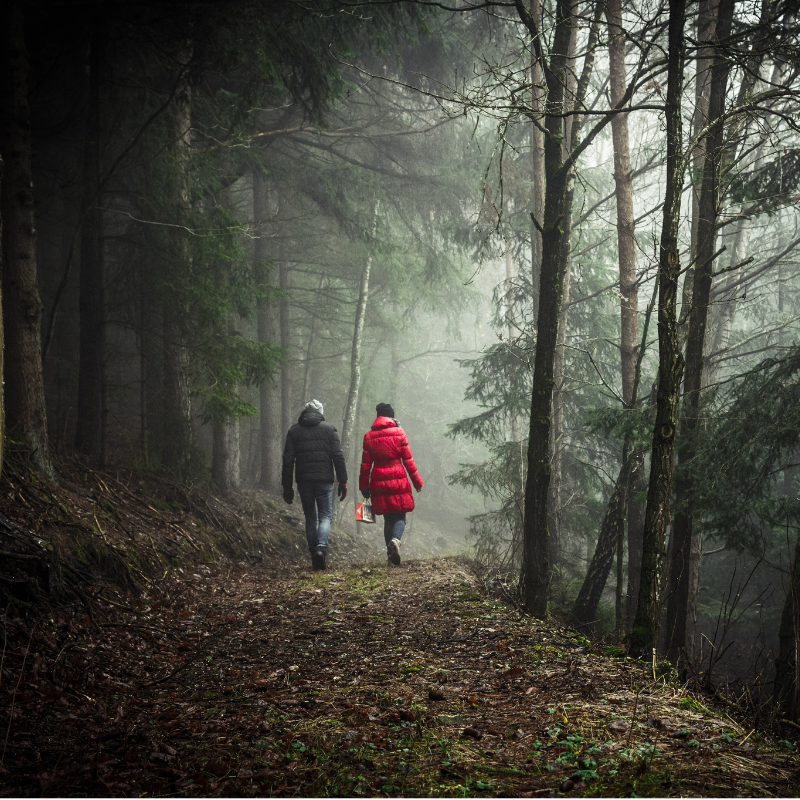 We have been checking out the HAP Balanced Living blog and recently found this awesome article – Facing Diabetes on Her Own Terms: How One Woman Took Control of Her Life. This article is about Shannon, a woman diagnosed with type 2 diabetes, who found a way to manage her disease without medication, through motivation and focus. Shannon had a family history of diabetes, so when she was diagnosed, she regarded the situation very seriously. She knew that she needed to make changes, and when she had a physically adverse reaction to metformin (a drug used to control blood sugar), she became determined to find an alternative to medication. To learn more about managing diabetes, Shannon took hospital-based classes for people recently diagnosed with the condition. Then, she also joined the diabetes prevention program at Henry Ford Macomb Hospital which provided great support and education. Healthy Living Medical Supply is in network with Health Alliance Plan of Michigan for diabetes testing supplies, insulin pumps, insulin pump supplies, and continuous glucose monitoring systems (CGM). If you are a Health Alliance Plan of Michigan member and are looking for diabetes-related supplies delivered to your doorstep with great customer care, give us a call at 866.779.8512 or send us a text message at 248.577.9903 to start the easy enrollment process.